Whether you are a football-crazed fan, have a strong affiliation with your home team, or if you just love sport, the magazine will bring you everything you would ever need to know about the most important matches around the English Premiere League and around the world. 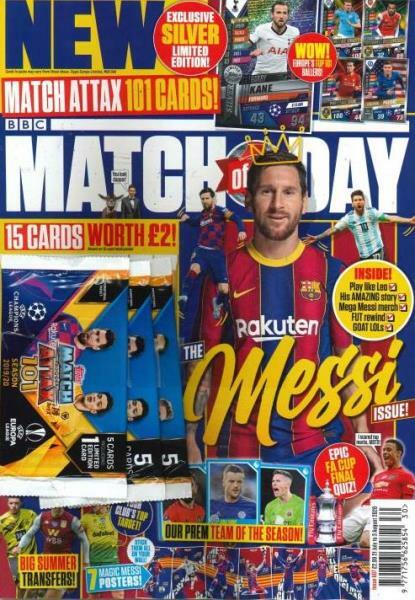 Buy a single copy or subscription to Match of the Day magazine. Every football fan and Premier League enthusiast turns to Match of the Day to stay up to date about all the latest news and results from some of the biggest and most important games happening. However, sometimes the other media outlets just aren’t enough to bring you all of the information regarding what’s happening with your most beloved teams. Each issue of Match of the Day magazine brings you up and close with your favorite players and club managers as well. You will be giving exclusive interviews and in-depth articles that cover every aspect that went into the player’s performance and match outcomes. No longer will you be left empty handed as to why your favorite team just didn’t pull it off this week, as this magazine showcases the latest reviews and coverage by leading experts in the football world. Also, in addition to the wealth of priceless information each issue will also give you spectacular photos and posters that are certainly a wonderful collectible. My grandson is delighted with his magazine and it keeps me informed too! My grandson loves it! No more no less - it ticks all the boxes. Keeps an eleven year old occupied for hours. I like to catch up on all the latest club and transfer news. My Grandson loves his magazine and reads it from cover to cover. Looks forward to it being delivered every week. My 12 year old Grandson has asked for a subscription to this as a Christmas present for the past 3 years. Needless to say he loves it and really looks forward to receiving it every week. My 7 year old son LOVES this magazine and can't wait to get home from school on a Tuesday to find it there for him! My Great Nephew loves it!